Europe's leaders feel they have already lost far too much political time on Brexit. 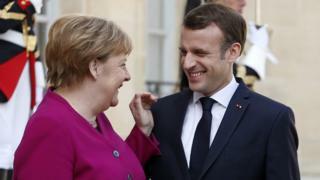 Again today, Prime Minister Theresa May heads to Paris and Berlin for talks with Emmanuel Macron and Angela Merkel - this after a number of phone calls on Monday with other EU leaders - with little up her sleeve or in her pocket to share with them. But far from showing impatience (OK, Berlin and Paris would have been happy with a call rather than a more time-consuming visit), EU leaders have welcomed being in contact with Mrs May ahead of Wednesday's Brexit summit. She doesn't have a great track record for "getting the tone right on the night" at EU gatherings. And with a no-deal Brexit looming this Friday, the EU thinks this is no time for misunderstandings. There is little European expectation that cross-party talks with opposition leader Jeremy Corbyn will come to fruition this week - if ever. So, EU leaders are curious to hear the prime minister's Plan B. They hope there is one, although they're not convinced. France's Emmanuel Macron has been built up in the press (and he has done much to encourage this image) as the Brexit villain who could veto an extension and force no deal on Friday. The first is bad for France, the other for Ireland (Mr Macron spoke of his solidarity with Ireland while in Dublin only last week) and for the EU as a whole - with a threat to the integrity of the single market along the border between Ireland and Northern Ireland after a no-deal Brexit. It's hard to see how the two last conditions could be made legally enforceable. But demanding "tough conditions" has as much to do with Mr Macron putting on his Defender of Europe hat for a wide audience, as anything else. Some feel a short extension would keep up the pressure on MPs to finally come to a Brexit conclusion. Others favour a longer extension - nine months to a year but with the UK able to duck out early after parliament ratifies a Brexit deal (the so-called "flextension"). The Belgian prime minister has asked an inner core of countries most affected by Brexit - including Germany, Ireland, the Netherlands and France - to meet a couple of hours before the summit on Wednesday starts to try to iron out some of their differences ahead of time.